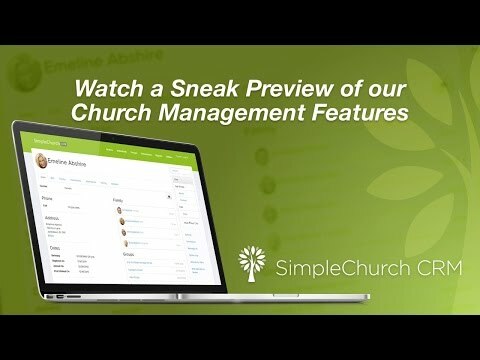 SimpleChurch CRM is a church management software designed to assist with relationship management between church staff, volunteers, and members. SimpleChurch enables users to manage events from multiple ministries in a single online calendar, with separate ministry calendars syncing with the central schedule. Users can prevent double-booking of facilities by reserving rooms and vehicles needed for events. SimpleChurch can also be used for equipment and room setup requests, and users are able to customize event approval processes for different events and members. SimpleChurch allows users to track total and individual attendance, with multiple options for member check-in, such as paper rosters, integrated mobile apps, and support for RFID cards. Users can specify whether absent members are excused or unexcused, and set reasons for absences in addition to the default options, which include sickness, work, and school. SimpleChurch also enables users to follow up with individuals who have missed multiple or all events within a given date range, with the option to assign interactions to staff for completion and view summaries of all previous interactions. SimpleChurch’s online giving feature gives users the ability to accept donations online, through mobiles phones, and at kiosks. Payment options can be set by users, including limiting online donations to only debit card payments, designed to discourage the use of credit cards by members. Payment processing can also be integrated into event registration, allowing members to pay for the event as they confirm their attendance. SimpleChurch creates graphs showing giving trends over time, generates deposit slips for the bank, produces itemized reports and giving statements, and donation records can be exported to QuickBooks. Overall it was a good first software for us. Unfortunately we weren't able to make it work. There customer support was very kind, but always gave me the same answer of "we will have to send that to our design team" and I would never hear back. After 6 months of doing that I had to start looking into a different software for our church. I really liked the simple design and would highly recommend it to people who are just getting started in the church management software.Child check-in was a breeze. Pastoral care was very good. Very easy interface and simple design. Quick and easy to learn. Users loved it! Affordable database management - organized several needs in one place (including attendance reports, online giving statements, check-in, mass contact, etc. )Simplicity in data management for churches. This software is so easy to learn and use. Access to the information and tools via web browser or phone app is also simple and convenient. Our experience with Simple Church has been amazing, their giving software as well as the reliability of the management software is amazing. Very easy to use, and very easy to create flows and followups, groups etc.Simple Church is a very easy but powerful software that it works great with any size church. Free 60-day trial, no credit card required. Pricing is based on number of people stored in the system. Users can assign roles to members, allowing them different permissions including viewing reports and editing member details, preventing individuals from being able to access or change personal information without authorization. SimpleChurch enables users to take attendance in multiple ways, including printed rosters, mobile apps, and RFID card scanning, and specify whether non-attending individuals are excused or unexcused, plus their reason for absence. Users can manage all church events in a single online calendar, even across multiple locations, with the ability to book rooms, reserve equipment and vehicles, and specify room setups. SimpleChurch offers users their own branded member interface for online donations, with flexible payment options including debit and credit cards and online checks, and payments are routed directly to the church’s bank account. Users can mass contact members and groups by text, voice message, or email with personalized messages. Below are some frequently asked questions for SimpleChurch CRM. Q. What type of pricing plans does SimpleChurch CRM offer? Q. Who are the typical users of SimpleChurch CRM? Q. What languages does SimpleChurch CRM support? Q. Does SimpleChurch CRM support mobile devices? Q. Does SimpleChurch CRM offer an API? No, SimpleChurch CRM does not have an API available. Q. What other apps does SimpleChurch CRM integrate with? Q. What level of support does SimpleChurch CRM offer? Q. Which apps is SimpleChurch CRM compared to most often?